John Oliver’s log home in Smoky Mountain National Park. 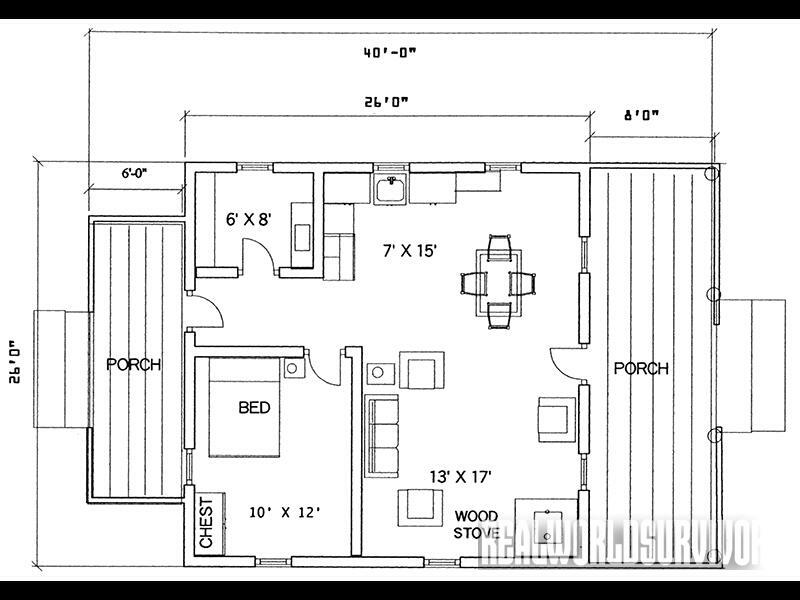 Floor plan for a two-room Appalachian-style cabin. Traditional Appalachian-style cabin with an upstairs sleeping loft. 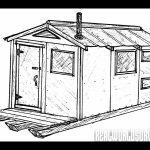 Plans for a one-room Appalachian-style cabin. David Brock’s one-room Appalachian-style cabin was built from logs and stone found on the building site. While simple, Brock’s cabin proved to be most comfortable year-round. Several years ago I was bear hunting in Alberta, Canada, and spent two weeks in a small trapper’s-style cabin that could be moved easily, when the ground was frozen, by hooking it to a farm tractor and sliding it from one location to another. The owner of the cabin built it for use during the winter trapping season and for use by his cowboys when grazing cows in remote areas during the summer. The cabin was small, but it was most comfortable once you got organized. Two of us stayed in the cabin, and enjoyed it even on days of bad weather when we couldn’t get out. The back wall of the cabin is the sleeping area. The bottom bunk is fixed, and the top bunk is hinged to the back wall. When in use the top bunk is pulled down and suspended in place with three chains hooked to the ceiling. When not in use it is pushed back up and locked in place, and the bottom bed serves as a couch. Similarly, a dining/work table is hinged alongside one wall in a location where one occupant can sit on the lower bunk and eat while the other cabin mate sits on a grub box. 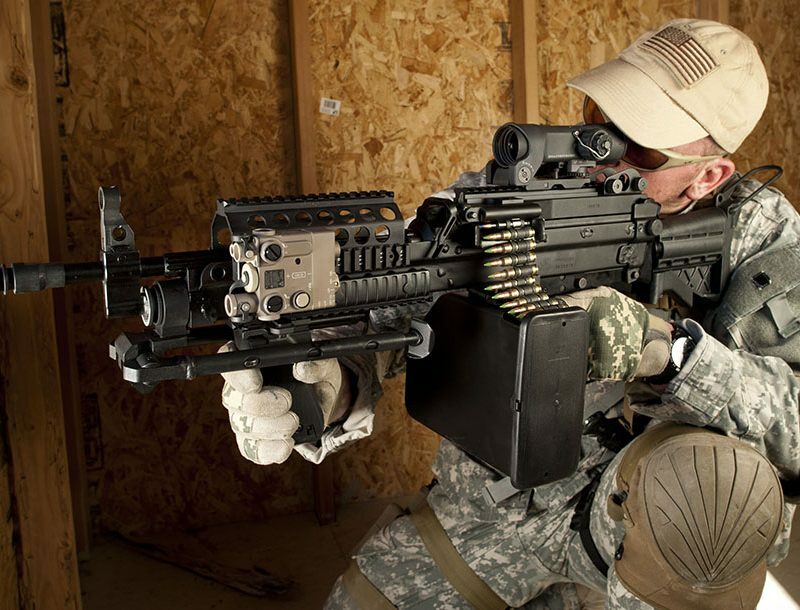 When not in use the table can be pushed up and locked in place, to make more room in the cabin. A small wood-burning stove is located in the front of the cabin, sharing the front wall with the cabin door. To make the cabin brighter and to make it feel larger, slide-open windows are located in the front wall to the right of the door, in the center of the right and left walls, and there are two small windows at the head of each bunk bed. These small windows give reading light on bad-weather days and ventilation in warm weather. Since then, I have stayed in several similar cabins while doing wildlife management work and hunting in the Arctic. 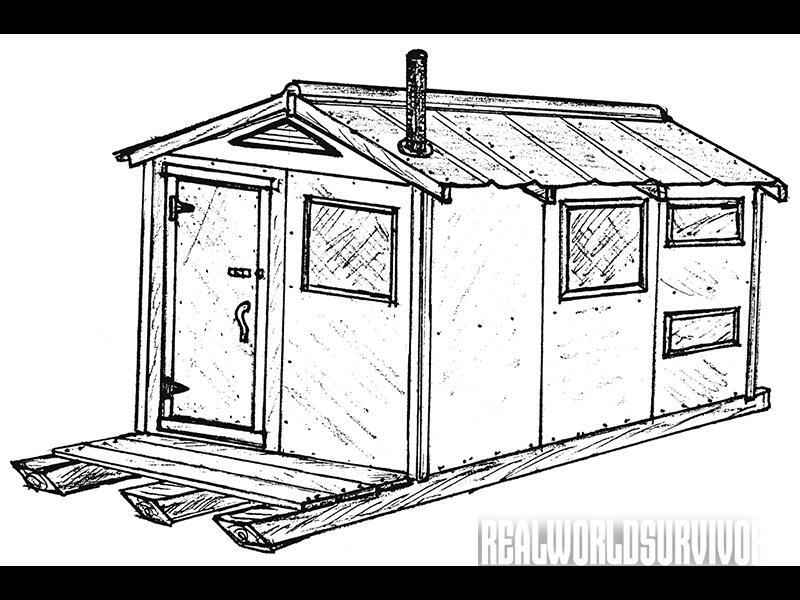 If a small, movable cabin is called for, here is an easy cabin to build. 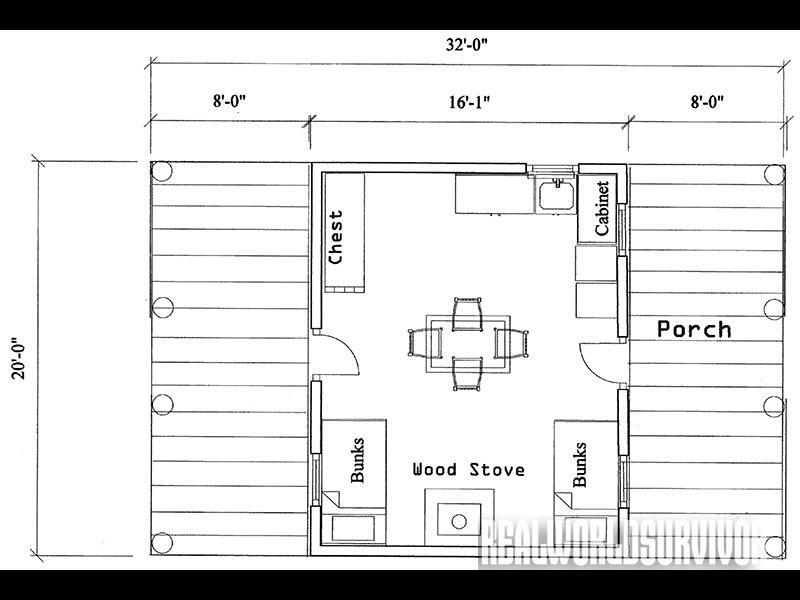 If I were to build one, I would put the bunks along the left wall looking towards the door, with the head of the bed against the front wall, and put the small stove in the back right-hand corner. For safety reasons, I would always like to be between the stove and front door in case of a fire, especially at night. The foundation is three 8-by-8-inch, 16-foot pressure-treated squared posts. One end of each post is cut on an angle to be placed at the front, with a large eyebolt installed, to slide easily when the cabin is moved. On this foundation, the cabin is built using standard framing techniques. 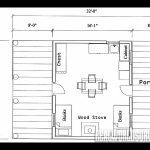 The dimensions of the cabin are 8 by 12 feet. The sidewalls are 8 feet high, with a ridge board height of 9 feet. The exterior siding is made from 3/8-inch exterior-grade plywood. 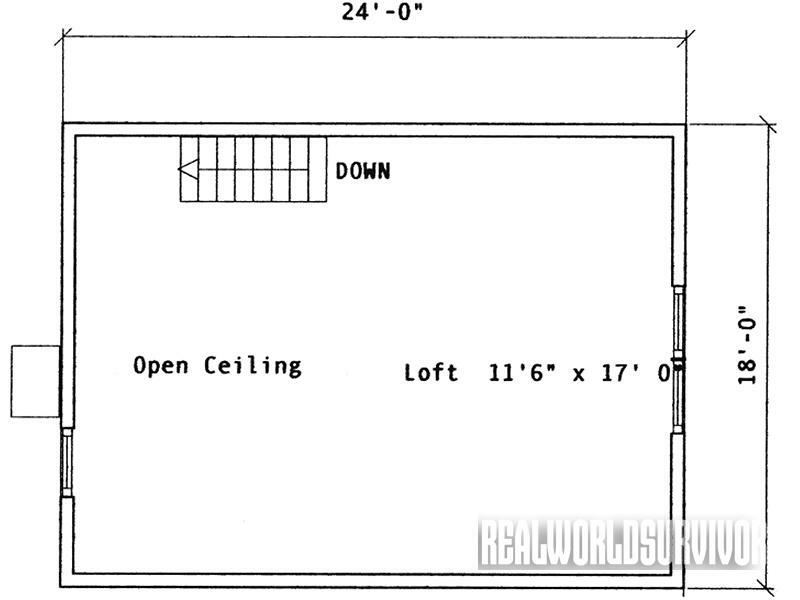 The floor, walls, and ceiling are insulated. The interior walls are 3/8-inch plywood painted white to brighten up the inside of the cabin. Roofing material can be metal, composition roofing, or roll roofing. All of these cabins I have stayed in had roll roofing, and it seemed to work fine. The gable ends of the cabin are louvered for ventilation with flaps that can be opened or closed as needed. The front of the cabin has a 4-by-8-foot deck made from pressure-treated 1-by-4-inch boards. During good weather, this deck is used for cooking on a camp stove, washing dishes, or just sitting outside. The sliding windows are made from Plexiglas to prevent them from breaking when the cabin is moved. When the cabin needs to be moved, pick a day when the ground is frozen. Using the eyebolts in the foundation timbers, hook the cabin to a tractor or bulldozer with a steel cable and slide it to its new setting. One such cabin that I stayed in was located on a marsh, and the owners moved it along the wet grass year-round. 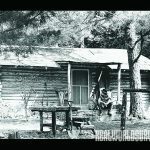 One of the oldest and most versatile cabin styles in the United States is the Appalachian-style cabin. To see an excellent collection of these cabins, all you have to do is go to the Great Smoky Mountains National Park and visit Cades Cove or the park’s visitor center near Cherokee, North Carolina. Early American settlers used these small but highly efficient cabins to raise large families. The cabin afforded shelter from weather as well as protection from raiding parties. 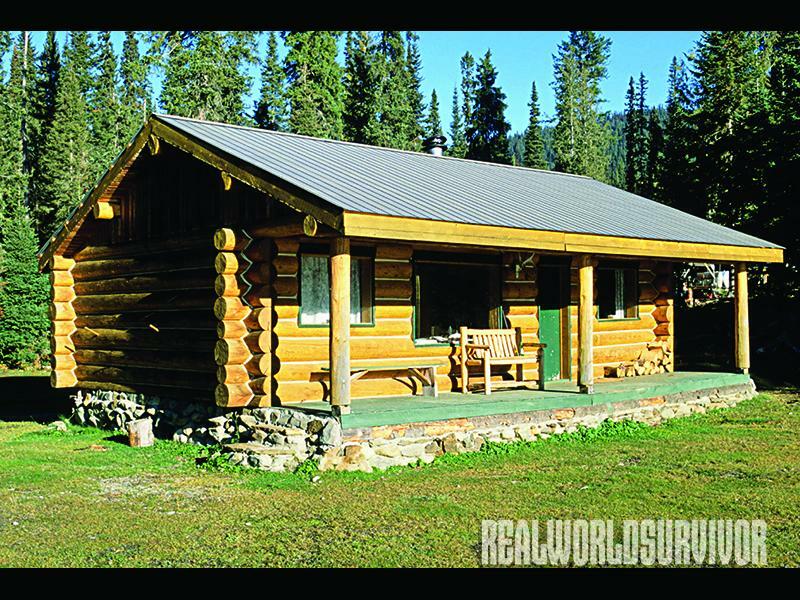 The Appalachian-style cabin differs from the Alaskan trapper’s-style cabin in that the front door is usually in the center of the long side of the cabin and the ridgepole of the roof runs parallel to the front of the cabin. In addition, the porch is on the long side of the cabin and usually runs the full length. The porch roof may be separate or it may be a continuation of the cabin roof. 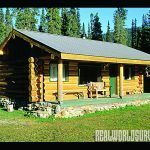 Where the Alaskan trapper’s-style cabin has a porch with a high ceiling and is usually open in the front, the Appalachian-style cabin porch has a low roof sloping to the front, giving more protection from blowing rain and snow. It may be screened easily, and is a good place to cook and sit during warm weather. I have stayed in cabins of this type where the porch was used for sleeping during hot weather. Most cabins of this type have a back door and a back porch similar to the front porch. 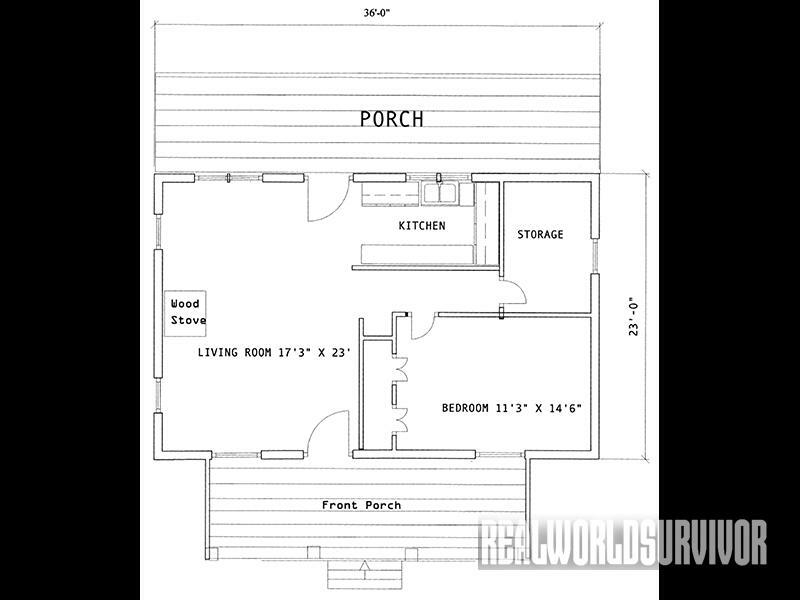 This porch may be screened in to add more covered usable space to the cabin. If the cabin is a self-sufficient cabin, a small table with a washbasin and bucket of water may be available for washing. Often there is a picnic table for fresh-air dining during warm weather. Having two porches adds much to the outside living capacity of the cabin, giving more room inside the structure during much of the year. 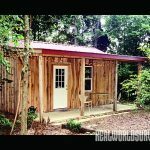 Several years ago, I built an Appalachian-style cabin that was 864 square feet in size and was one of the most comfortable cabins I have lived in. Since the cabin I built was near a road and getting trucks into the site was easy, I elected to pour a concrete foundation. Once the foundation had hardened, I hired two carpenters to frame the cabin and put on the roof. The roofing material was composition shingles. For the exterior and interior walls, I decided to use reverse board-and-batten. The walls were framed using the same construction guidelines as in my Alaskan trapper’s-style cabin. Rather than have cathedral ceilings, however, in this cabin I put in 8-foot ceilings, using sheetrock as a ceiling material, painted white to brighten up the interior. The ceiling was insulated with R-19 fiberglass insulation. The two-room cabin was actually divided into four areas—a large living/dining room, a kitchen, a bedroom and a storage room. If modern conveniences were desired, the storage room could be made into a bathroom without much trouble. All interior walls were made of reverse board-and-batten. For heating, a rock hearth was built into the living room for a wood-burning Franklin stove. 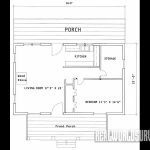 If a fireplace were desired, it could be worked into this plan easily. The lighting, refrigeration, and cooking were designed to use propane from a central system supplied from a large tank located to the rear of the cabin. To let in light and the beauty from the outdoors, two windows were located along each exterior wall. The best views were to the rear of the cabin, so double windows were hung at the dining area and over the kitchen sink, both along the back wall. 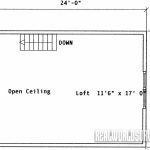 The attic had louvered openings for ventilation, and an entrance was built into the ceiling of the storage room so that it could be accessed for additional storage. Porch supports were pressure-treated 4-by-4-inch squared beams. The porch railings were made from pressure-treated 2-by-4-inch boards. 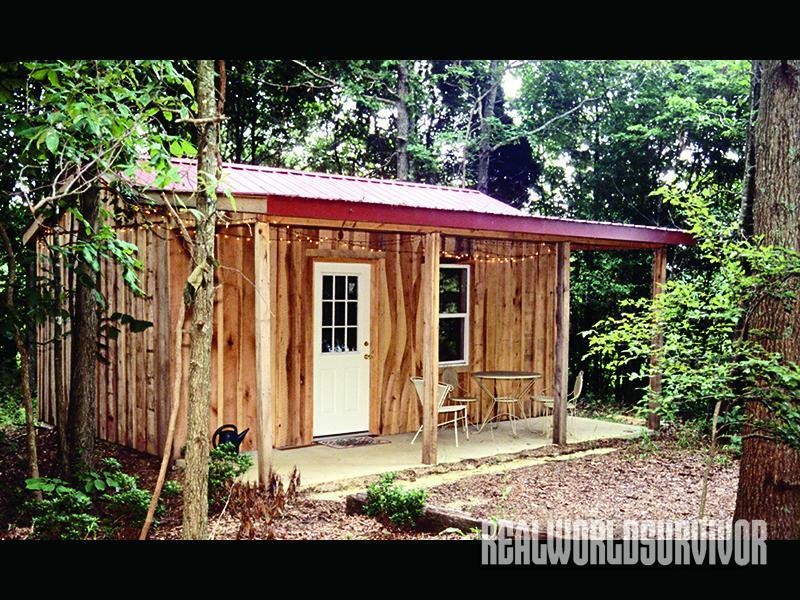 A traditional Appalachian-style cabin is easy to build and really looks good if built from squared logs. 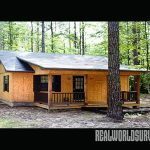 The traditional cabin is a two-story structure with a ground floor of 432 square feet and a sleeping loft of 216 square feet. The living room has a vaulted ceiling with exposed rafters, and stairs along the back wall leading to the sleeping loft. A railing runs across the sleeping loft to prevent falls into the living room. The kitchen and dining area occupies the space under the sleeping loft. 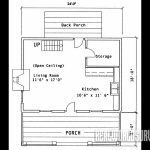 The floor plan allows for storage room in the back of the kitchen/dining area or, if modern conveniences are wanted, a bath can be located there. This cabin is very similar to the cabins used by pioneers in the 1700s and 1800s. It is quick and easy to build and can sleep up to eight people in comfort. 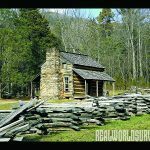 One of the best examples illustrating just how simple and inexpensive this style of cabin is to build is the Appalachian cabin built by a young friend of mine, David Brock. 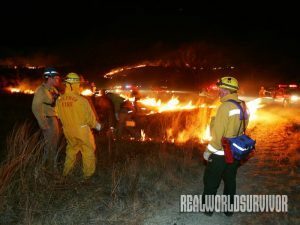 David had finished high school and attended college, but the “call of the wild” kept him from studying as much as he should. 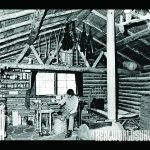 He wanted to go into the woods and build a self-sufficient cabin, from native materials, and basically live off the land. Finally, the urge overcame him, and he made up his mind to give the back-to-the-land lifestyle a try. Site selection was easy for David. 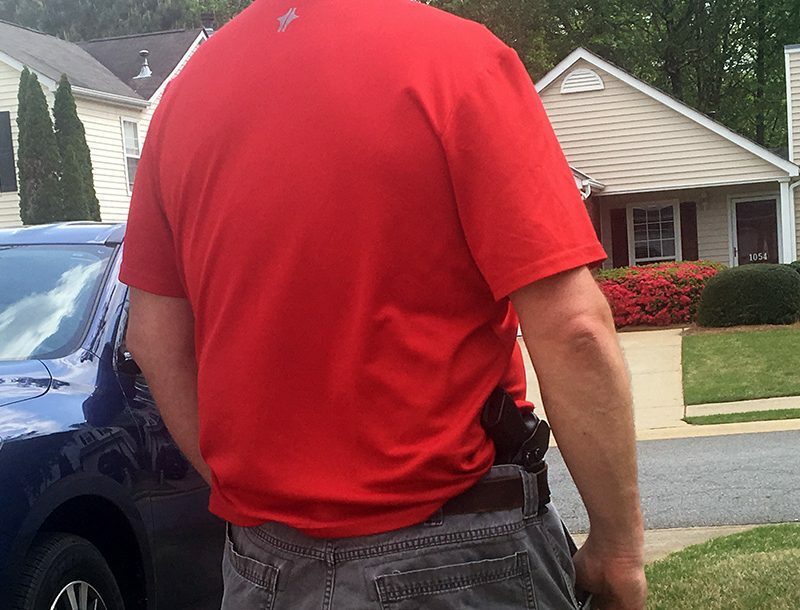 His family had a farm in central Alabama that he had always wanted to live on. There was a wooded hill on the farm, with a spring on it, where David had dreamed of building a cabin. His family gave their approval, and David set about realizing his dream. 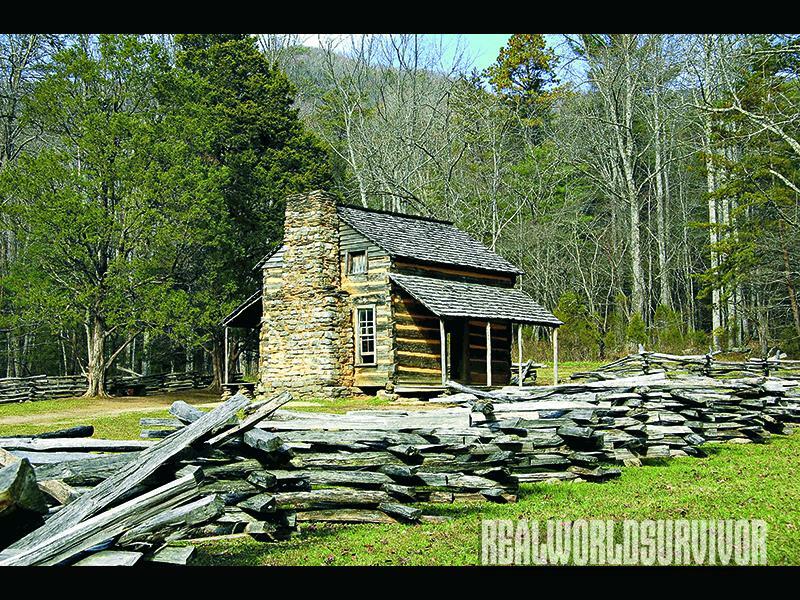 His cabin design was a log one-room Appalachian style that measured 24 by 30 feet. 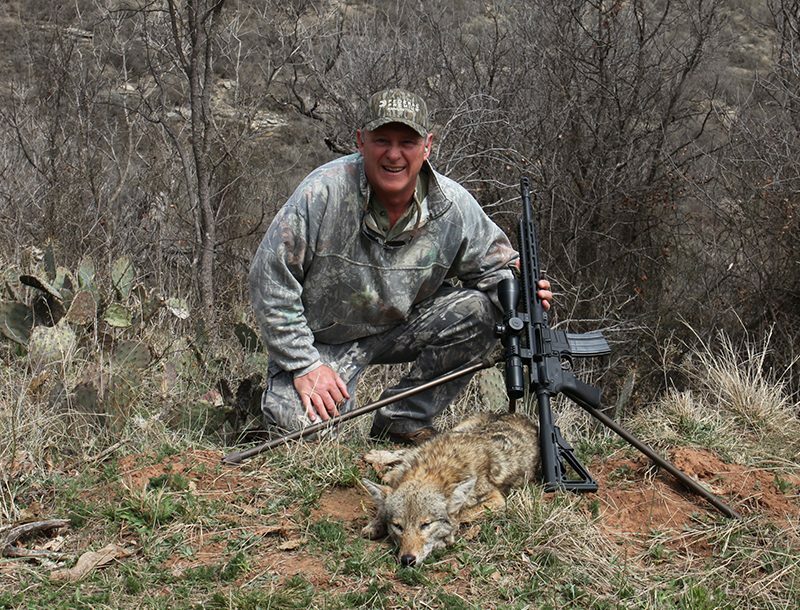 He began by staking out the cabin footprint on the hill. He studied the view from the front porch, the route to the spring, the trees he would cut to build the cabin and the position of the sun at all hours. David also wanted a good view from the double window he planned to put in the cabin just over his dining/work table. This was important, as it would also serve as his desk where he would spend hours writing. He took the time to move the cabin layout around until he got it just right. 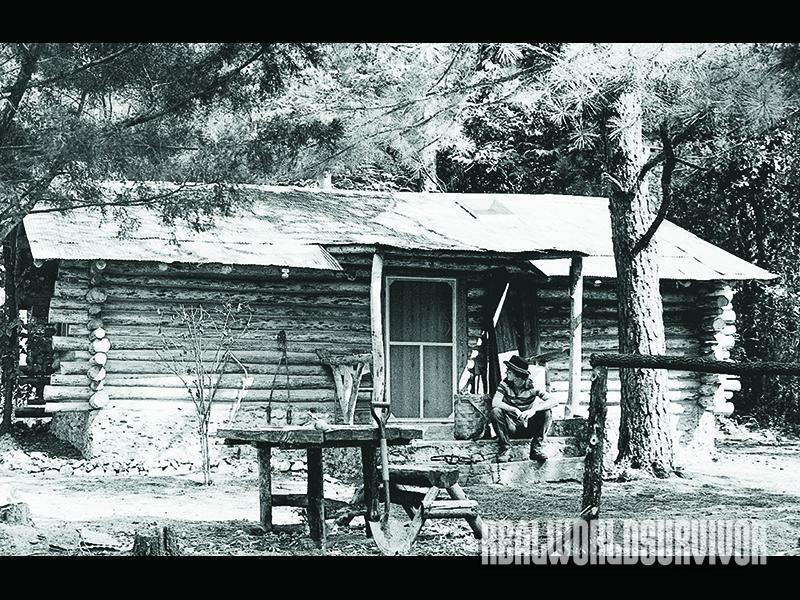 Once the cabin was staked out to his satisfaction, he began gathering native building materials from around the property. He assembled piles of rocks with which to build the foundation, floor, fireplace, and steps. Next, he cut logs for the cabin and outbuildings. He even cut small trees from which to build much of his cabin furniture. The metal roof was recycled from an old barn on the farm. It took David several months to build the cabin himself but it was a labor of love, and the finished cabin showed it. In one end of the cabin where he planned to have his sitting area, library and couch, he had planned to build a rock fireplace. David knew the fireplace would never heat the 720-square-foot room, so he installed a central wood-burning stove. The opposite end of the cabin was the cooking and sleeping area. Much of his cooking is done on a standard-size gas kitchen stove, which uses propane gas. His dining table under double windows indeed enjoys the outstanding view he had envisioned. David elected not to put a front porch across the entire front of his cabin, just enough porch to give the door plenty of protection. My son and I visited David soon after he completed his cabin. I was impressed. 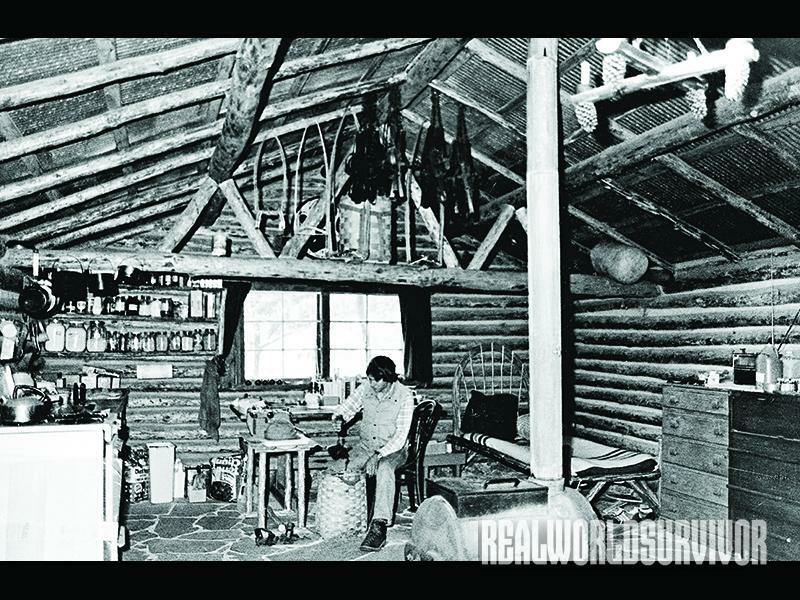 He had built his dream cabin alone using native materials found on the farm. It was a comfortable cabin yet rustic enough to make you want to take a lot of photos. 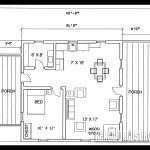 The accompanying plan shows a simple one-room cabin design that I have seen a lot in the Ozarks and the southern Appalachian Mountains. 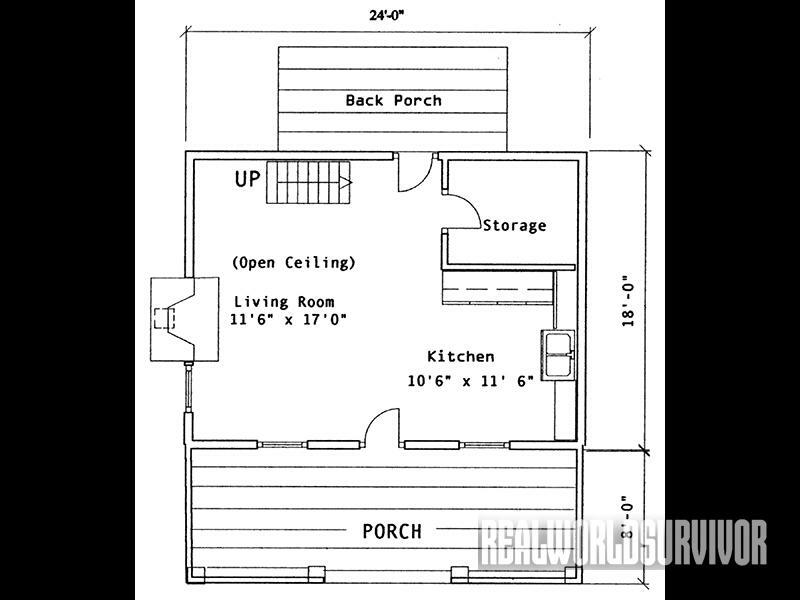 It is small, only about 320 square feet inside, but it works well for two to four people. It is heated with a wood-burning stove and is designed to be self-sufficient. Eight-foot porches on the front and back give a lot of covered space outside to eat, take care of equipment, visit or store gear. 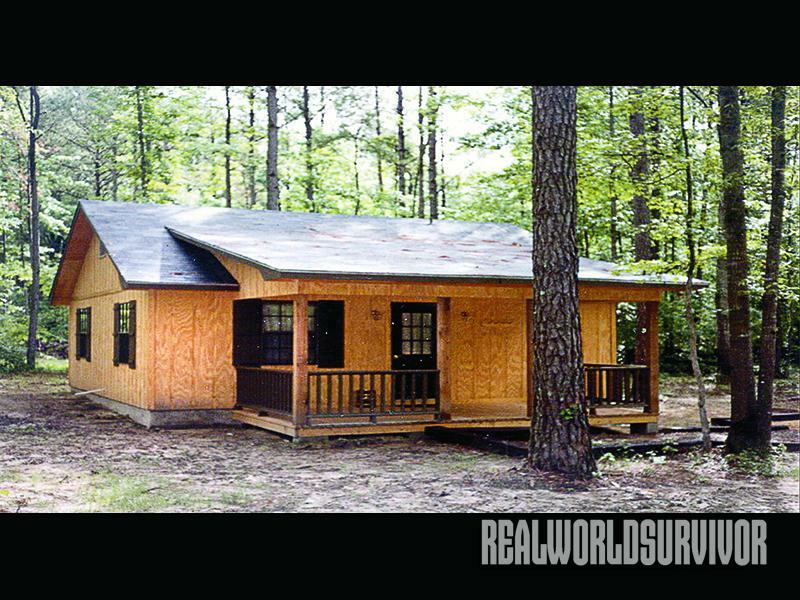 It is a fast and easy cabin to build and lends itself well to remote locations. 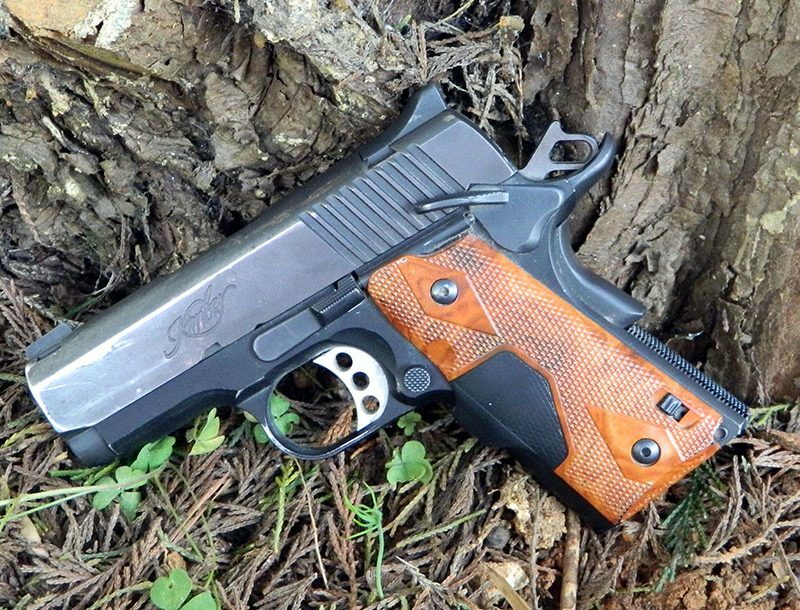 I visited one in Virginia that was 3 miles from the nearest road, but the builders got the building materials to the site with a four-wheel-drive pickup truck. Editor’s Note: Material was reprinted by permission of Skyhorse Publishing from How To Build Your Dream Cabin In The Woods by J. Wayne Fears. Visit skyhorsepublishing.com for more information.